Following the traditions of the very first residents of Chevy Chase, there are many reading groups today. These include small book clubs that meet in members' homes as well as larger groups that meet at community centers and at the Chevy Chase Library. 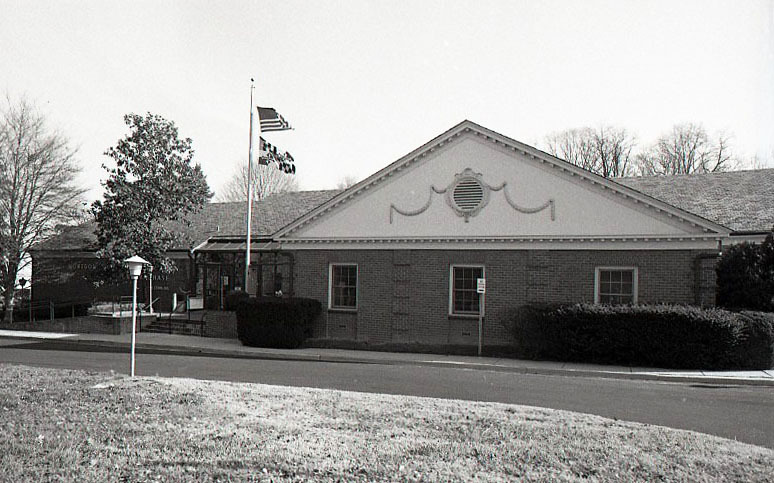 In 1965, the Montgomery County Public Library built a new library further north on Connecticut Avenue, and readers meet there on a regular basis. 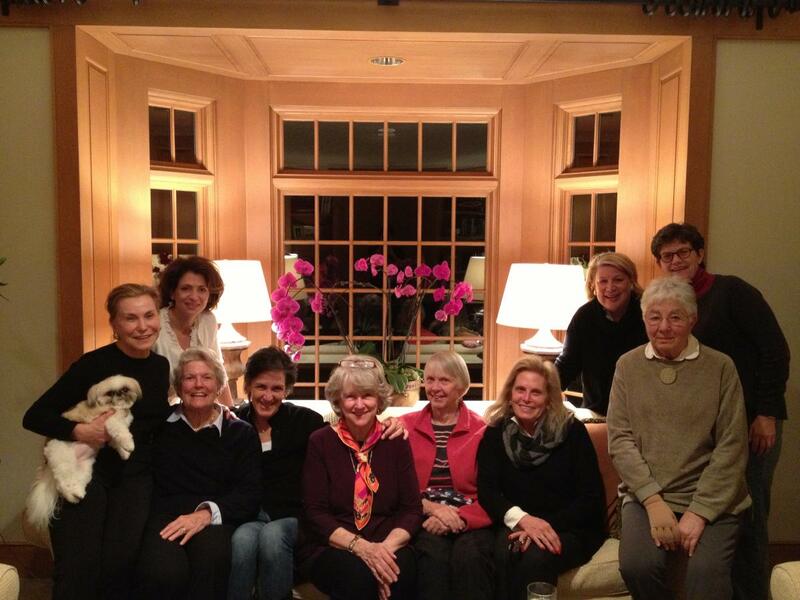 Members of the Chevy Chase Atheneum Book Club, in 2013. “The group formed almost a decade ago, when the husband of one of our neighbors was diagnosed with an aggressive form of cancer. We wanted to form a support circle for her, the Primrose Street book group was born. About 15 women from the first block of Primrose Street meet once a month (except for August), and we ALWAYS have food! Typically, the person who selects the book hosts, but that's not always the case. We haven't really established a book selection method, but over the years we've experimented with both fiction and non-fiction, with a goal of learning about a time, place or person that's new to us. “We've recently embarked on a theme of women, to celebrate the 100th anniversary of the suffrage movement. We are currently reading the new autobiography of Sonia Sotomayor. We will probably reach back further into history for our next selection. 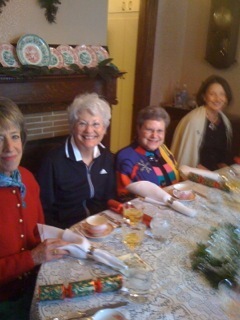 Members of the Primrose Street Book Club in 2013. 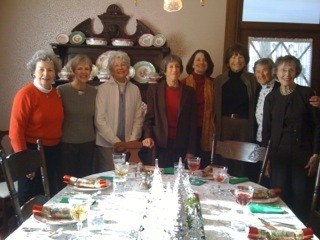 Left to right, Jeanne Ruesch, Naomi Camper, Meg Stillman, Deb Jospin, Sandy Geller, Joan Gaul, Susan Jones, Barbara Kline, Paula Toth, and Ruth Katz. The Jefferson Café, a public discussion group, meets at the Chevy Chase Public Library on the third Friday of the month, from 10:30 until noon, to discuss an article or essay related to contemporary events. There is no meeting in August. The discussions are led by a facilitator, who selects an article or essay for each month. Information about the article to be discussed is available on the Friends of the Chevy Chase Library webpage, and the Friends also pay for reproduction of the articles. Sometimes authors are invited to join the group. The Jefferson Café is just one of the reading and discussion groups that the Chevy Chase Public Library offers its patrons. There are also two reading groups and a memoir group, and with the support of the Friends of the Chevy Chase Library, they meet on a regular basis, too. The Chevy Chase Public Library, 8005 Connecticut Avenue, Chevy Chase, Maryland.